ReGeneration should have been our national Talent plan. Why? It was designed to be practical. As of 2010 a lot of initiatives emerged in Greece to support youth growth and development -some good ones and some to simply build the profile of some people- but ReGeneration made an innovative step forward. Read this blog post or hear the podcast above. Before introducing you to ReGeneration, let me give you a background. The Greek economy is impacted by structural youth unemployment since 2002. Every year it was more evident that we over-supplying the market with identical, commoditized professional armies. No intend to specialization. No innovation clusters, opening up new paths to segments and geographies. The economy was (and continues to be) a closed model with little opportunity for growth. Domestic banks were financing enterprises to compete in the domestic-only arena, and to provide services to the State-owned businesses (construction, health, legal, insurance, supplies, advertising etc.). In such an old-minded, closed, and commoditized, importing economy you can easily imagine the outcome of young talented future employees when searching for work. What kind of aspiration to have in the deep marsh of 90% imported goods, +30% factories closing, approx. 22K family-owned businesses, and only 100 approximately multinationals? As you can easily picture, young talent was in the marathon to acquire degree-MBA-2 foreign languages (used to be a recipe for talent acquisition) but was deprived of real insights and learnings where the world is going. No one ever discussed in public what changes we will witness with the disruptive mobility of iPhone in 2007, the 4G/LTE, and the global scaling trend of big legacy or startup offerings. As of 2010 a lot of initiatives emerged in Greece to support youth growth and development -some good ones and some to simply build the profile of some people- but ReGeneration made an innovative step forward. Why? It was designed to be practical. It is a program that simulates real-life scenario for young talent. Whoever applies, goes through a full-360o real-life-challenging program. The practical side of it puts applicants out of their comfort zone… Apply your best CV and profile. No matter your selected profession, from logistics to food chemistry, up to marketing and sales. Compete with 5.000 applicants. Go into an AI-like gamified (“Game-based Assessment”) personality test. Your rated profile reaches volunteering managers from private companies. They invite you to a really tough job interview (with no BS-biases of the HR generalists). You get real-time feedback. You know where you lack behind. You get accepted or not for objective criteria. Start with orientation training. Functional training. Inspirational talks. Workshops. For 56 hours at the minimum. Then, learn how to make your CV. Your final ‘file’ is open to all the initiative’s supporting private companies (note: all industries are represented). They browse candidate profiles, sector, personality tests and they choose. Then, you go on a 6-months paid internship (agreed by all constituents, minimum wage of 750/month). Real experience. Line manager feedbacks to you and ReGeneration. Ah! you are also obliged to do community project work for 25 hours. All the above are important to guide Talent to outperform themselves and get in every step practical guiding beacons and insights. Before all, they compete, but on real, hard criteria. Then, they get to meet good examples of tutors and team leaders. Last but not least, they are asked by context and conditions to work for companies, realizing if they fit-in, or if they lack hands-on skills. It is not just an internship program. As I’ve explained, it’s a holistic approach to foster professional and personal development. Employment opportunities, integrated training program and community service, 3in1! 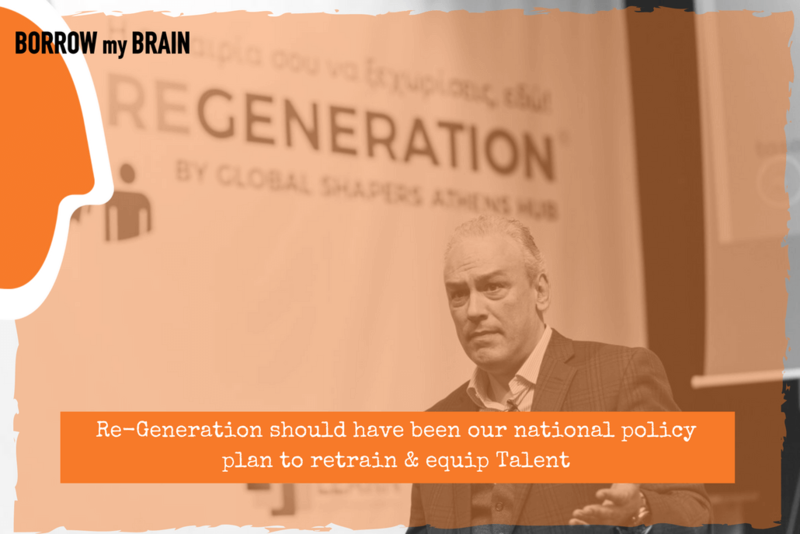 ReGeneration was “born” in a period of heightened unemployment and talent leak abroad, mainly due to the economic crisis Greece still faces today. It is a project of the Global Shapers Athens Hub, an initiative of the World Economic Forum (WEF) designed to help combat both youth unemployment and the brain drain phenomenon – when talented graduates flee Greece to find employment abroad. It is supported by Hellenic Initiative, Coca-Cola Foundation, Stavros Niarchos Foundation and 151 company-partners. Imagine, 150 top-employers in the national economy under one roof… You see, this is a bridge between young Talent, labour market situation, and companies seeking to find the top-skilled entry-level personnel to meet their seasonal or long-term needs. Do you think that the above process could have been implemented by a University? OK, the question is a joke! No university has the networking relationship capabilities or the perceived manpower credibility, or the (DNA) openness to build bridges with the hundreds of companies that ReGeneration managed to get as supporters. Secondly, University professors are not allowed to take on such initiatives, or they don’t care to support the next gen. Then, the public sector as a whole (including Universities) has a negative stance on the private sector’s activations. Last but not least, if you were a professor allocating your time to an EU-funded project, or to Consulting, would you be able to activate and build such long-term view mechanisms? Why 151 companies support it? For sure it’s a good perception building selection to be part of such an initiative. Some might do it for their brand ‘goodwill’ sentiment, others for believing in it. I’m convinced that they all realize the main benefit: they get the best candidates/interns, out of a qualitative selection process. Instead of getting thousands of parity-looking CVs offline or through recruitment platforms, they get ‘ready-made’ top-candidates that came out of a trusted, professional initiative and a rigorous selection process. The initiative doesn’t only challenge positively youth unemployment as a Mission, but it brings measurable results. Note this down: 82% of internships have been renewed! Was it the perfect match for the right candidates and companies, or a seasonal workforce gap? Anyhow, the 82% result is a stimulus to the government officials. Let me be clear what do I mean. Instead of packing 76.000 thousands of university students every year in market irrelevant studies, giving them little practical research or market experience, levelling top-talent with bored peers we should have had already (as a national policy) an institution/hub/office/process to connect Talent with the market. Otherwise, as a society, we risk more things than youth unemployment and these are Competitiveness, Growth, Expansion, Exports, Cocreation. Have we realized what’s going on around us? A study recently conducted by the University of Bath, and York St. John University in the UK (published in Psychological Bulletin) shows that millennials are the generation most predisposed to perfectionism and in turn, this may well be affecting their mental health in ways that their parents and grandparents may not have experienced. Millennials are experiencing higher levels of anxiety, depression, and thoughts of suicide than generations past. Google and you’ll find more career-path related issues that young Talent is facing. It will become harder for the next 20 years’ transformation… Regeneration and initiatives of this scope have a positive emotional impact on job-seekers? ReGeneration gives us a hint on how do we need to change. Although we are 38 years away from the 80’s, governments and their adjacent societies still focus on individual improvement, both in the economic and social sphere. Get a higher education, go to university, get an MBA, languages X and you’re set to go for prosperity. This is not true anymore. Now it’s the time to find the best, but help others see clearly on improvements. Give feedback and raise young talent through on-going training solutions until their 22’s. Now is the time to instal, from school and on, critical thinking, conceptualizing, and skills-based learning paths. Avoid putting a burden on learning conformities, but invest in real talent development. If we do all of the above, we won’t be a ‘failed’ society and economy. If we do all these, we don’t need ReGeneration. Until then, thank you ReGeneration for being here and showing a better talent acquisition way to all of us! PS: My ‘hat off’ to the Regeneration’s project management team. You can’t believe the drive, persistence, respect and seniority they own.